Meet Beau... which translates as Beautiful, something I think you'll agree is certainly true about this gorgeous Rabbit. I was asked to paint this by Nathanael who wanted to get something special as a surprise for his girlfriend's Birthday. Unfortunately Beau passed away last year which was difficult as he had been her pet for a long time, so having a lasting memory of him was a lovely idea. 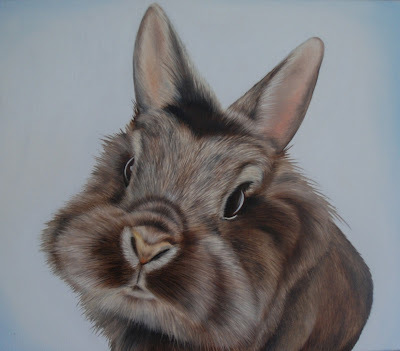 We went for a small size canvas and Nathanael sent over some photos for me to work from, I loved painting this and although it took a lot of time and patience to get his fur to look so fluffy it was a great challenge. I sent Nathanael a photo of the painting when it was finished and he just couldn't wait for the real thing to arrive before showing his girlfriend, he said "she loves it which is I think one of the best presents she has received for a birthday gift" it's always so nice to know when a surprise is well received!